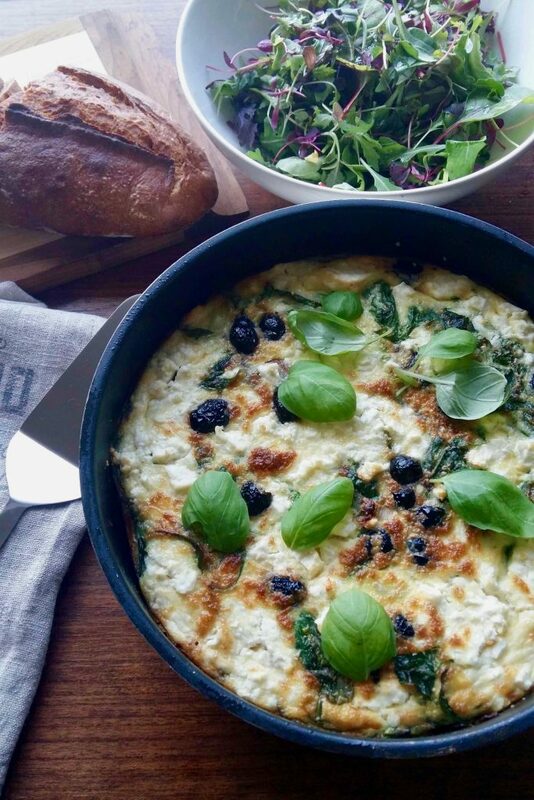 Quick and easy to make, frittata is one of those versatile dishes that works at various times of the day, whether for brunch, lunch or a light weekday supper. This is where it features in in Love Apples, in which the protagonist, Kate, cooks it up for her friend and flatmate, Chloe, after work one night. With some difficult affairs of the heart to discuss, it’s the perfect option since it requires little thought and can be whipped up in between chats and gulps of wine – a crisp sauvignon blanc or, in this case, sancerre, are ideal. 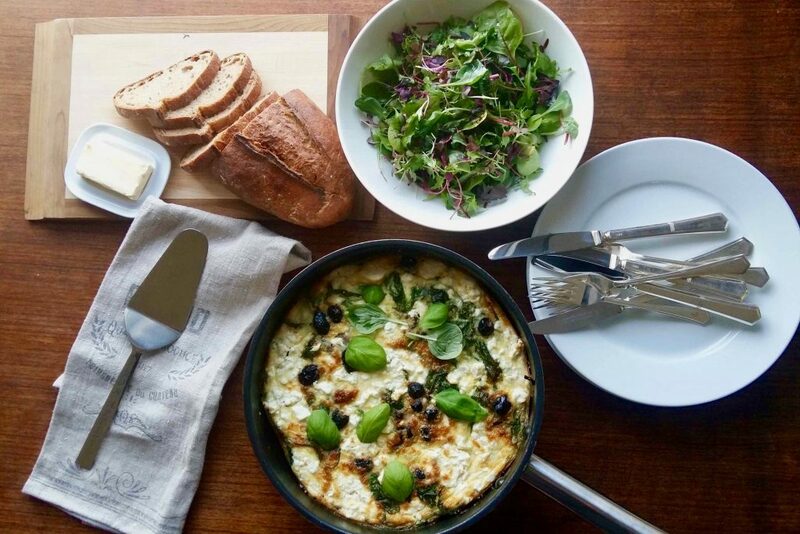 Frittata’s a great stop-gap for impromptu meals, as it combines basics that I generally have in stock – eggs, milk, cheese, onions, potatoes, olives – and you can ring the changes depending on what you have available. You could use leeks in place of the red onion, for example, although I love, love, love the flavour that the caramelised onion brings to this version (use the biggest one you can find, or even two, as it shrinks as it’s slow-cooked over a low heat to becomes sweet, soft and delicious). Sweet potato or butternut make a nice alternative to potato (which, rather than boiling, I cube, toss in olive oil and sea salt, and oven-roast for around half an hour at 200 degrees C/390 degrees F before adding it to the pan), and you can use a choice of cheeses. I generally use feta to keep things light but provolone will provide a crispier top making for a more indulgent, comforting version – you could also compromise and mix up the two. 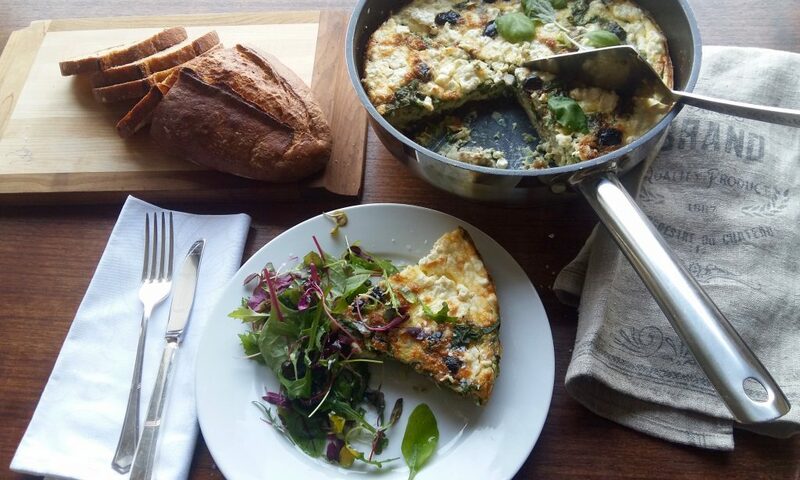 As the frittata is loaded with flavour, keep the side simple. The green salad with a chive dressing, below, is perfect, but if I’m serving it for breakfast, I’ll skip the salad, replace the basil with dill in the frittata, leaving out the olives, and serve it with a side of smoked salmon and grilled asparagus – plus a chilled glass or two of prosecco! Preheat oven to 180 degrees C/350 degrees F. Spray the sides of a thick-bottomed stainless-steel pan (that has straight sides and an ovenproof handle) with cooking spray. Heat butter with olive oil in the pan. Add onion and fry over high heat for 1 minute. Turn down the heat to low and cook slowly for 15 minutes or until caramelised. Remove pan from heat, add potato and spinach, and gently mix together. Combine the eggs and egg whites with the milk, and beat until light and frothy. Add chopped basil to the egg mixture, and season with salt and pepper. Pour the egg mixture into the pan. Mix with other ingredients, making sure the spinach is covered. Sprinkle over cheese and olives. Cook on the stovetop over medium heat for 2 minutes to set on the bottom, and then place in preheated oven. Bake for 20 minutes or until centre is set. Remove from the oven. Place under a preheated grill for 3–4 minutes or until golden brown and puffed up. Cut into wedges and serve immediately with a green salad. For speed and convenience, peel and cube your potatoes before boiling. Place in a pot, cover with cold water, add 1 teaspoon salt and bring to the boil then reduce heat to medium and simmer uncovered for around 10 minutes. Test potatoes with the tip of a knife to ensure they’re firm (undercooked is better than overcooked). Drain immediately. Serves 4–6 as an accompaniment. Wash greens and combine in a salad bowl. In a separate bowl, whisk together the mustard, honey, salt, pepper, and vinegar. Slowly add the olive oil, whisking constantly so the dressing emulsifies and thickens, and then stir in the chives. Allow to sit for at least 10 minutes so that the flavours develop. Whisk again before dressing the salad. Add 2 tablespoons of dressing to the greens, and toss gently but well so that the leaves are thoroughly coated. Add more if required, but avoid overdressing (you don’t want heavy, soggy leaves). Transfer to a bowl or individual plates, and sprinkle over chive flowers, if using.